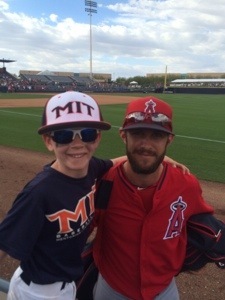 “Hey Matt, will you take a picture with my son?” As I shouted those words at the Peoria Sports complex back in March, I was not sure if I would get the photo. But true to everything I have read about Matt Long, he walked over, put an arm around Lefty and I got this photo. May not seem like the most earth shattering moment to you, but to me it was exactly what I wanted out of a Spring Training game with Lefty. I got the opportunity to tell Lefty about Matt Long, the type of ball player I would be proud of Lefty becoming. Matt crossed my radar this year as I watched the Angel’s spring training games. Every time he was in the game, he seemed to make something happen. According to Scout.com, he isn’t big by stature or overall size at 5′ 11″, and 175 pounds, but what he lacks in size, he has in hustle. Long has a combination of hitting the ball hard, good running on the base paths and outstanding speed. In 49 at bats this Spring, Matt hit .408. Taylor Ward on Scout.com states that every teams wants a guy like Matt Long on their roster. Long is pretty darn close to being a Major Leaguer, and if he were to be on any other team, possibly a starter. Long is a guy who could easily win a heart and hustle award, because he plays at 100% every game, which is very easy to like. Truly, when we (at Scout.com) talked about Long as a group, we all had stories about how much we all liked this guy. After reading that, I was instantly a fan and someone I wanted Lefty to watch and emulate. Matt was selected by the Los Angeles Angels of Anaheim out of Santa Clara University in the 30th round (No. 921 overall) of the June 2009 draft. Long started the 2014 season with Triple-A Salt Lake Bees out of Spring Training, but is expected to see at least a few Major League appearances over the 2014 season. Possibly even gain a full time spot on the 25-man roster depending on how well he excels at the Major League level. Thanks for the photo Matt! And thanks for giving Lefty an example of how to play the game and the type of ball player to become. Good luck this year! You have two new fans.